This years event was a huge success with engaging seminars and demonstrations provided by our strategic partners, Axzo Nobel and LKQ, " said Rick Perez, Chief Operations Officer. 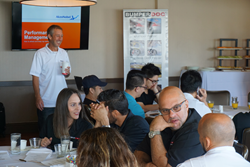 Bumperdoc Franchises, an Automotive Auto Body and Paint franchise, hosted its annual National Franchise Convention at The Rusty Pelican in Key Biscaine, Florida on October 13. The company offered seminars, sales and technical training, and honored franchisees for their commitment to success at the annual Awards Banquet for outstanding BumperDoc business owners. "This years event was a huge success with engaging seminars and demonstrations provided by our strategic partners, Axzo Nobel and LKQ, " said Rick Perez, chief operations officer. "We are an emerging franchisor and owe our success to our current franchise owners." Art and Arte Hanson, a husband and wife team who own a location in Colorado Springs, CO, won the Franchisee of The Year Award. "It was an unexpected honor to be chosen as Franchise of the Year," said Art Hanson. "Arte and I were extremely surprised and happy to be recognized for the hard work and challenges we have faced over the past six years. This award really belongs to our employees, current and past. We couldn't have done it without them. The support the Franchise Team have given has also been a key for success."